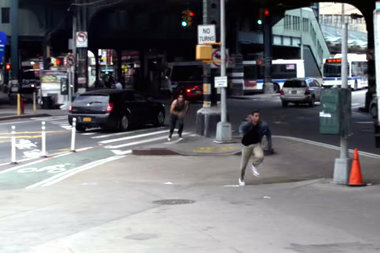 "The Spectacular Jihad of Taz Rahim" filmed in Jackson Heights last summer. JACKSON HEIGHTS — A new Queens-based movie is using music and humor to tackle a controversial NYPD program that recruits Muslim residents as informants. “The Spectacular Jihad of Taz Rahim” is a hip-hop dramedy that tells the story of an aspiring rapper from Queens who becomes an undercover source for the police department, according to Ridwan Zayd, one of the film’s producers. The NYPD, which did not immediately respond to request for comment, reportedly recruited Muslim immigrants arrested for minor crimes to assist them in a program — separate from their surveillance program, which was disbanded last year. The film was shot last summer all around the city, but Jackson Heights was a major location, including Kabab King, Diversity Plaza and Roosevelt Avenue. The main character, Taz Rahim, a Bangladeshi immigrant who lives in Jackson Heights, is a “wannabe rapper... but he thinks he’s so cool,” Zayd said. After he gets arrested, Rahim is pulled into a new "double life" that's unlike anything he's ever experienced, the trailer shows. It was not clear what he was arrested for. The fictional story is inspired by real events but takes a lighthearted approach in order to start a discussion on the serious implications of targeted recruitment, Zayd, 26, said. There are no Bollywood dance scenes, but extended music sequences, he added. “We wanted to highlight this issue of how the NYPD wasn't really hiring trained guys to be doing this work,” he said. Another producer, Zaki Hossain, knew someone who was an informant and heard his story, which compelled them to make the film, Zayd said. “We wanted to be able to make this a topic that people could talk about, and we added a little humor to it bring people's walls down,” he said. The film is also a story about personal ambition and what people will do for power, Zayd said. “It was a great perk to film in New York," Zayd said. "The Spectacular Jihad of Taz Rahim" will premiere May 15 at the AMC 25 Theater in Times Square, and will be released to other cities through the spring.